Poor doors in London and New York City housing developments segregate residents by income. Should low-income residents of a single building be forced to use a different door? Photo illustration by Slate. Photo by iStock. The mayors of New York City and London are currently caught up in a social and design controversy that has touched nerves on both sides of the Atlantic: the practice of building separate entrances for poorer residents of new inner-city housing units. In Manhattan, the New York Times reports on the Extell Development project on the Upper West Side at 40 Riverside Blvd., which won permission to build separate entrances that will keep its lower-income apartments neatly segregated from its market-rate condominiums thanks to a Bloomberg-era zoning law. It’s too late to correct what is seen by many as a distasteful, possibly sinister, social blunder on Riverside Boulevard, which was approved in 2009, but Mayor Bill de Blasio has said he is in favor of banning the practice going forward (even if he voted for it as a councilman), vowing to reverse the zoning laws that made it possible in his effort to increase affordable housing in Manhattan. The Guardian included twin photos of a building at 1 Commercial St. in London that featured a luxurious lobby entrance for upmarket tenants and a side entrance tucked into an alley for affordable-housing residents. Even residents’ mailboxes and garbage-disposal areas are separate. London Mayor Boris Johnson, who is required to approve all new housing projects of 150 units or more, has gone on the record as saying that he doesn’t like the separate entrances and encourages removing them from building plans whenever possible. But the Guardian reported Monday that he has ruled out a poor-door ban, arguing that it can help curb housing costs for poorer residents who can’t afford the service charges associated with doormen or posh common spaces. “Separate doors mean that housing associations offering the cheaper homes can avoid the high service charges paid for plush communal areas, but reports about the split entrances have underlined concerns about the capital’s increasingly polarized property market,” the Guardian wrote. Of course the classist notion of having separate entrances to a single dwelling is nothing new. At 5 Tudor City Place in Manhattan, for example, a multimillion-dollar penthouse has a private elevator, while 20-some other floors of 1920s microapartments, many of which are too small to be legally built today, share a block of four elevators. Large buildings or fancy homes sometimes have service entrances for employees. In Paris, another world capital with an affordable housing crisis, the miniature (starting at 53-square-foot) former maids’ rooms (known as chambres de bonne) found in many elegant Haussmanian apartment buildings are typically top-floor walkups where the servants used to live. In recent years they have been rebaptized with the more politically correct term studettes and become an affordable, if not always glamorous, option for students and those of modest means who lack access to subsidized housing. They are often reached by dedicated service staircases or the occasional service elevator. When they are accessible by elevator or the main stairwell of the building, those features are always underlined in real estate ads as a selling point, even though these rooms often do not include showers, kitchens, or private toilets. You may live in a room built for a 19th-century servant, it seems to suggest, but you can ascend to your quarters on the same elegant staircase that is shared by everyone. But the chambre de bonne is a relic from another century, not a 21st-century housing project. The new housing units in question are designed to offer tax breaks to developers in exchange for the token gesture of including some subsidized housing in the mix in a world of rising income inequality and increasingly populated world capitals short on affordable housing stock. 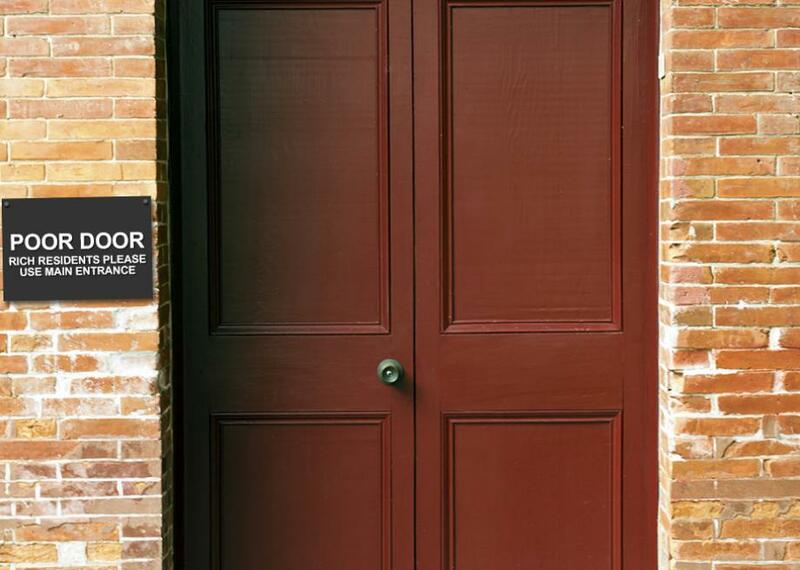 The poor door is a clumsy, undemocratic, mean-spirited design solution to an underlying social problem. Those who are lucky enough to qualify for affordable housing don’t need the dignity-crushing daily reminder that they haven’t earned the right to rub shoulders with their very own neighbors.